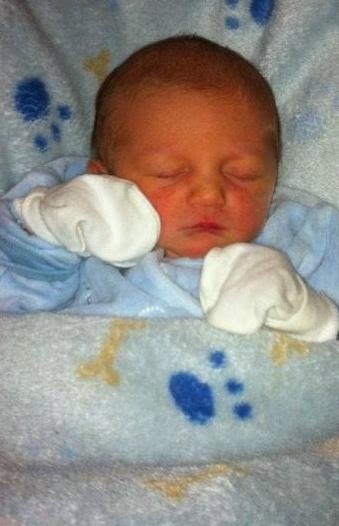 A new father killed his five-week-old son because he felt fatherhood meant 'his life was over', a UK court heard today. 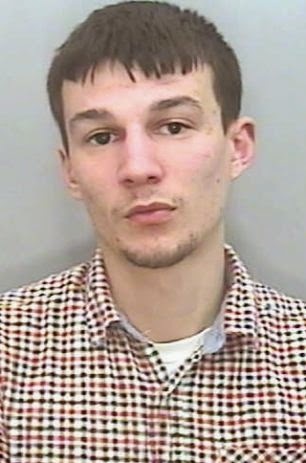 Matthew Wickens, 24, lost his temper when he was left alone with baby Riley Gardener at the family home in Paignton, Devon. He shook his son, before slamming his face into a cot - causing him to suffer severe head injuries. But now, Wickens has been jailed for six years and five months after admitting manslaughter at Exeter Crown Court. Simon Laws QC, prosecuting, said Wickens and Miss Gardener had had an 'on-off' relationship while she was pregnant with Riley, with the former even having 'a relationship with another woman'. He said Wickens had initially appeared fine with the idea of having a second son, but then ‘got cold feet and became ambivalent towards fatherhood’. 'He seemed unwilling or unable to commit himself wholeheartedly to domestic life and regarded it as restricting his freedoms,' he said. But despite his apparent unwillingness, Wickens eventually moved into Miss Gardener's flat in a bid to 'prove his commitment to their relationship’, the court heard. Mr Laws said Wickens had felt Riley's birth two years ago meant ‘his life was over’ - and that he had felt he would ‘just be a father all the time’ and not going out like his friends. The supermarket worker, who had hoped to join the Army, ‘did not like to be told what I can do and what I cannot do’ by his partner, he said. But one day, Wickens agreed to look after Riley as Miss Gardener and their older son, Jayden, went out shopping, the court heard. He bottle-fed and changed the baby, before losing his temper and assaulting his son - shaking him, before slamming his head face down into a cot. Despite Riley's severe head injuries, Wickens, who was 22 at the time, then failed to summon any medical help for his son. And when Riley’s mother returned home with Jayden from shopping, Wickens left her to discover her 'dying or dead son' in his bed, the court heard. He then repeatedly lied about what had happened - and even put a hat on Riley to cover up a mark on his forehead. At one point, he claimed he had banged his son's head against the metal arm of a baby swing, before dropping him on the bedroom floor. His lies meant that Miss Gardener fell under the suspicion of the police - and was forced to give up Jayden for 14 months while she battled care proceedings. However, a post-mortem examination later revealed that Riley had died from shaking and an impact on November 25, 2012. He said Wickens had showed ‘cowardice and selfishness to not say what had happened straight away’ at the flat in the Winner Street area of Paignton. He added that the defendant may have been tired after getting up in the night to see to Riley while working long hours, but that was ‘no excuse’ because parents have to carry on. Sentencing Wickens, Judge Francis Gilbert QC told him it would remain a 'heavy burden for the rest of your life that you killed your own child'. He added that the defendant wished he could turn back the clock and that it had ‘all been a bad dream’.